Lichen thalli may grow together and fuse, and this may happen between different species and genera.p23 These are called 'mechanical hybrids'. They get noticed when the two forms are differently coloured. ↑ R.D. Seppelt (1995). ""Phytogeography of continental Antarctic lichens"". 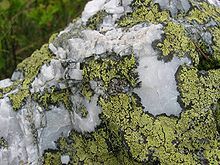 The Lichenologist (Cambridge University Press) (27): 417-431. http://journals.cambridge.org/action/displayAbstract?fromPage=online&aid=957340. ↑ Sancho L.G. et al (2007). "Lichens survive in space: results from the 2005 LICHENS experiment.". Astrobiology 7 (3): 443–454. doi:10.1089/ast.2006.0046 . http://www.ncbi.nlm.nih.gov/sites/entrez?db=pubmed&uid=17630840&cmd=showdetailview&indexed=google. Retrieved 2007-12-22. ↑ Casselman, Karen Leigh & Dean, Jenny (1999). Wild color: the complete guide to making and using natural dyes. New York: Watson-Guptill. ISBN 0-8230-5727-5 . This page was last changed on 4 December 2014, at 17:47.